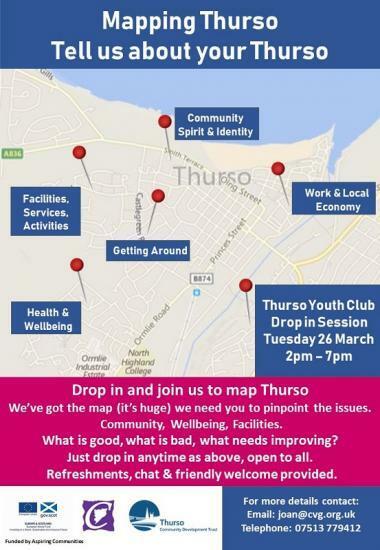 As part of the community consultation being completed in Thurso an event is being organised by Joan on Tuesday March 26th at Thurso Youth Club where residents, groups, service providers and agencies are invited to come along and help to map Thurso. A large wall filling map of the town has been designed and will ask those attending to consider among other topics the facilities, services and activities available for health and wellbeing. How individuals get around the town, what is good about Thurso, what is bad about Thurso and what do people feel needs to be improved? How good is our place? and this consultation event builds on that by looking at the town in a different way and asking those who may not have contributed then to get involved now in an accessible, innovative and informal way. In the past few months I have very clearly found that there is great work going on in the town but not everyone knows what is available and where. This gives us a starting point to mapping those in addition to consulting our community in a new way." The event takes place at Thurso Youth Club on Tuesday 26th March 2019 as drop in sessions from 2pm - 7pm. Refreshments will be provided along with a friendly welcome and chat about Thurso. All are welcome to attend from community groups, facility and activity providers, residents of Thurso and anyone else who may be interested. Should further details be required please contact Joan via email to joan@cvg.org.uk.